William Charles Cooper was also known as W.C. Cooper or by his friends and family as “Boody” Boody would be raised and educated in Kansas as a farmers son. It has been claimed by others in the family that Boody learned the art of “Dry Ground Farming” well as a young man. He would follow a farming life style most of his life. William would marry in Thayer Kansas Nov.29 1893 to his life long bride Emma Lillian St Germain of Illinois U.S.A. They would have five children together . Boody and Emma would make their living farming in Nebraska and Wyoming until 1930. I have copied a portion of William’s Journal starting a few days before they leave for their new adventures in Canada. This Journal account has many spelling errors ,they have been transcribed as accurately as possible from the Journal. All entries before May 8 1930 have been Edited for space reasons. 8. We are thinking of pulling out off hear about tomorrow. Think we will buy some soldering irons to sell on the road. I am most sick with a cold the last few days. 9. Leave Denver about noon, bought 6 doz. soldering irons at $1.15 each. Take the agency form B .C Canada. May be a joke. Blow hard all day. 10.Blow and storm all night, start for Wray co starter on car goes on the bum, have to stop at tourist camp 30 miles south of Wray, rained , snowing , mud and slush regular blizzard at night. 12, Get to McCook in evening, had a heck of a time , rain , mud and snow. 23. Start from McCook and go to Cedar bluffs , stop at Marcy for dinner, go south and hit highway for Alice’s. 24. Dive about 300 miles and get to Alice’s at night, 18 miles north- east of Topeka Kansas. 17. Get to Alvin’s camp at night near Cody. 18.Visit big dam at CODY. 19 . Start out and camp north of Roundup, Montana. 23. Get to CALGARY, CANADA. And go out to Jesse. STILL AT Jesse, help him build on his new house and the 17, my birthday have a little party, have a case of beer and a good time. I buy a lot near Jesse, pay $25.00 down and balance of $100.00 in three equal yearly payments. 23. Wednesday . we break camp from Jesse at about 1 o’clock and go south to Mc,Cloud and west over crow nest pass to B.C, camp at night about 4 miles west of crow nest pass. 7.We arrive at Burns Lake, look around town, pretty dead, drive out to Frances Lake in evening, camp at Ed, Sattles and look over the country offal hard times all over the world. 12.Rent a blacksmith shop and expect to stay all winter. 13. Start work on fixing up and cleaning out shop. 14. Move rest of camp to Burns Lake and will live in one corner of shop. William and Emma would sell the Blacksmith shop in the spring of 1933. Not having the Blacksmiths shop allowed them to travel back to the U.S. for about six months . They would visit family and friends as far south as New Mexico. They would return to Burns Lake and Purchase the Ford Place . This location would be home untill 1938. Boody would hold an actution and sell this property (I do not know what the acerage may have been). 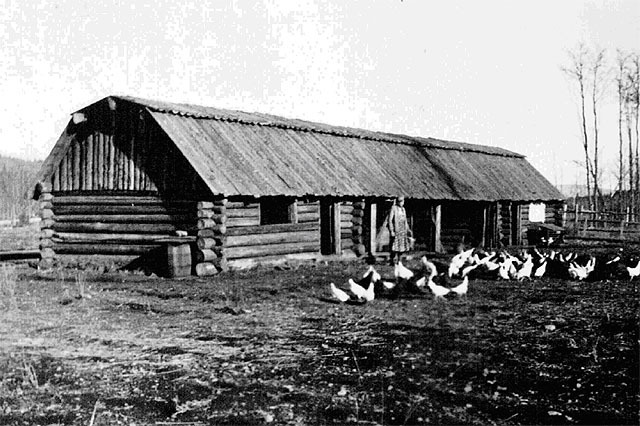 Once again Boody and Emma would return to the U.S. for a visit and once again returning to Burns Lake to purchase the Hensly place, they would live on this place for two or three years. The last sale and purchase of land in the Burns Lake area for Boody and Emma was from the Hensly place to a location on Francios Lake (this place on Francios Lake was Known as “Sandy’s Resort” in the 1970’s). 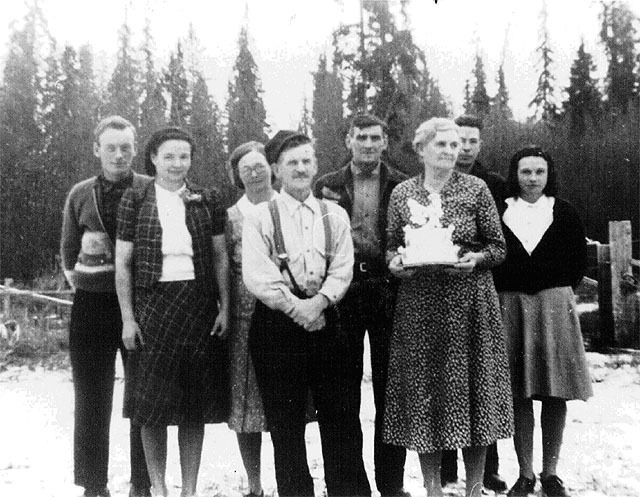 Boody and Emma would retire from the Burns lake area and move to Kamloops in 1945. Boody and Emma left behind in Burns Lake/Francios Lake their son Lee Cooper and his family. Boody writes the burns Lake news paper thanking all who have wrote him in the Vancouver hospital. William Charles Cooper and Emma Lillian Cooper would spend their last years in Vernon. Both would celebrate their 70th wedding annivesery. NOTE: Cooper descendant, Mel Cooper, wishes to establish contacts in the Lakes District area for the following information. Old photos of the Blacksmiths shop,Hogan's Hardware,old Francois Lake school,Timothy seed plant, The old Francois Lake Ferry or any other photos that are relevant to Cooper history in the area.